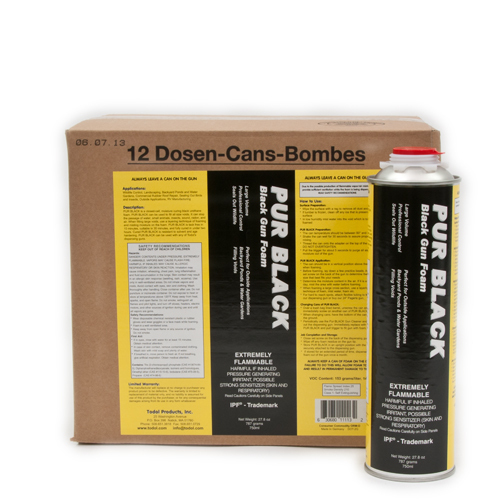 Pur Black Todol foam, 32 oz. cans, 12 cans per case. Great for doing bat exclusion work, i.e. sealing cracks, around pipes, anywhere where a rodent, bird or insect may enter a structure. Foam hardens in approx. 15 - 20 minutes. For additional security while rodent-proofing, you should consider installing copper mesh first, and then foaming over it. Rodents may attempt to chew through the foam, but when they hit the copper mesh they'll STOP ! FOR USE WITH FOAM GUN SOLD SEPERATELY.